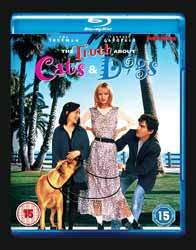 The Truth about Cats and Dogs (1996. 1 hr, 37 min) is a romantic comedy, directed by Michael Lehmann from an Audrey Wells script. The film takes its thematic influence from Edmond Rostand’s play Cyrano de Bergerac (1897). The film takes its title from Abby’s talk show and is not a reflection on male and female roles. There is much to like in the film's quirky look at the problems of dating. Uma Thurman takes on the role of Noellle, a woman blest with beauty if not so many brains. Janeane Garofalo plays Abby and if the film has a flaw it’s that Abby is easily as attractive as Noelle, so Brian’s (Ben Chaplin) fixation on the outward appearance of Noelle and even Abby’s self-depreciation does not always ring true. Much like the original play, the film plays on the fact that the lover has fallen in love with a voice, whose words alone have created the idea of courtship. Abby does not provide much in the way of dialogue for Noelle, so it’s hard to credit that he does not realise that she is neither a vet, nor does she have the same vocal patterns as the real Abby. Noelle does her best to maintain the illusion that she is Abby, even to the point of sticking her finger up a tortoises arse, all the while trying to get Brian to notice the real Abby. Unfortunately, the human heart has a mind of its own and just as Cyrano falls in love with Roxanne, Noelle starts to have feelings for Brian. If the film wasn’t such a traditional comedy it would have ended with Brian getting neither woman, having proved himself to be shallow, but of course that is not how Hollywood likes things to pan out. What you end up with is a fluffy comedy, well-acted by the main cast, inoffensive and mildly amusing.